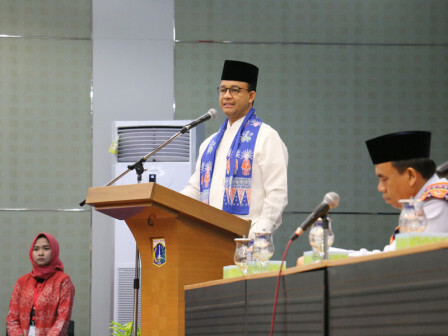 Jakarta Governor, Anies Baswedan wants all urban village and sub-district apparatuses to socialize Land Boundary Mapping Movement (Gema Patas).
" Residents must be encouraged to participate in it"
Socialization is needed to succeed Complete Systematic Land Registration (PTSL) program and to organize Jakarta Government land asset administration orderly. According to him, Jakarta should be an example of the success of this movement. Not only become the standard, but also become success point for local and central government. "If it can be succeed in capital city, then so do the other regions. We want to ensure government program actually can be applied properly and successfully," he stated after opening Gema Patas socialization for urban villages and sub-districts at City Hall, Friday (8/31). He explained, Gema Patas is not only a community movement for socialization and consultation. But it needs participation and collaboration from all parties. "Residents must be encourage d to participate in it. We need mutual cooperation to measure and mapping the land. Moreover, residents are actually benefited through this act," he mentioned. Meanwhile, Jakarta Secretary, Saefullah assessed, lands in Jakarta could be organized through Gema Patas act. "This land mapping will give a positive result," he expressed. He added, this moment could be a chance for residents to complete their land administration until they have land certification. "It is important as a valid proof of land ownership," he stated.